176 pages | 17 B/W Illus. The rapidly changing market environment in China requires more research to understand fully the empirical processes of management practice and the business landscape in which they operate. 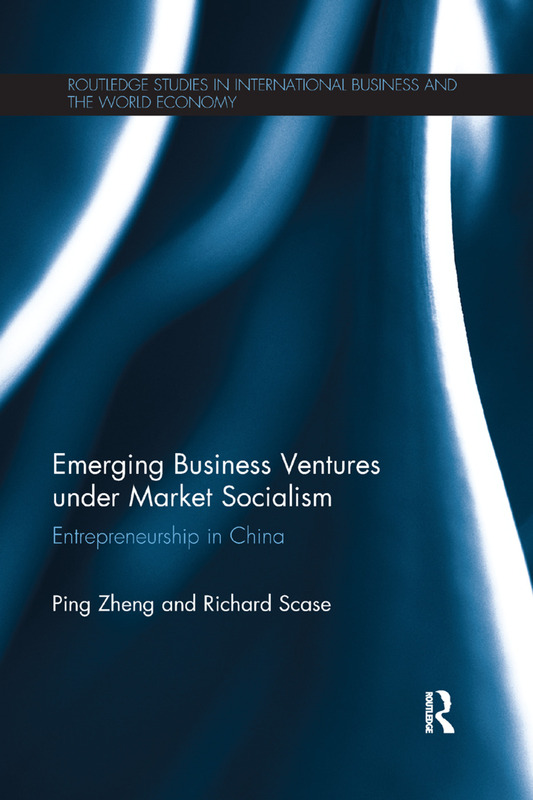 Based on longitudinal case study research between 2005 and 2010, this book explores the distinctive characteristics of emerging forms of economic enterprise under market socialism in China. Adopting a holistic view, it explores how rapid environmental and institutional changes in economic reforms are impacting upon their practice, and assesses the role of government policy in shaping their ownership and management processes. Through the changing patterns in the development of business ventures, it outlines the dynamics of industrial and organizational change under the transitional phases of a market socialist economy, and explores the tensions which emerge. This comparative perspective will be of interest to academics, researchers and advanced students of business growth and enterprise management, particularly those wishing to explore China, Chinese business and emerging economies. China impacts the world – yet there’s a shortage of insight into how the Chinese run business. This book helps fill the gap – detailed case studies provide rich insight into different patterns of management in distinctive business contexts. A valuable contribution to our understanding of emerging forms of enterprise within market socialism. This new volume is an important addition to the growing literature on entrepreneurship in emerging market economies. The authors are established experts in the field with a record of critical perspectives on public policy, it also makes for a very good read. I strongly recommend it. This book describes how entrepreneurship has been evolving in China in both the state and private sectors, despite traditional enterprise theories stating that new business ventures shouldn’t flourish because of administrative burdens. Understanding the dynamics of industrial and organisational change in this emerging economy context is important, not just to correct misunderstandings for western firms and managers who wish to learn about the strategies and management processes required to secure a successful entry to China and its market, but also to improve our wider understanding of entrepreneurship and the conditions which can encourage and sustain it. China is the new land of business opportunity but, for outsiders, it can be a perilous mission as they seek to understand and navigate the multitude of different types of business structure that comprise modern market socialism. This book is essential for anyone wanting to do business with, or understand the more subtle workings of, Chinese business as its written by authors who are not just leading authorities in the area but have also been successful entrepreneurs in both China and the West, which gives it a unique insight and gravitas that sets this book apart from other texts. This book provides vivid case studies about institutional changes under market socialism in China. By showing empirical processes of how state-owned enterprises and privately owned enterprises function in China, the authors fill a significant gap in the entrepreneurship literature about China. This book has relevant examples of Chinese business, which makes it accessible to managers and students at different levels. Given the significance of China's economy to the world, this book makes a timely contribution. In this chapter, we review the historical legacy and characteristics in the development of market socialism in China and examine the general environment within which economic enterprises operate: the economic, political and institutional systems. It defines the concept of market socialism and describes the major influences on the development of market socialism, such as economic and institutional reforms, privatization, WTO accession and the impact of foreign direct investment. A summary account for the formation of market socialism is presented in this chapter. This chapter explains entrepreneurship, privatization, ownership and government policies in relation to institutional change in China’s economic transition. The focus is on emerging forms of different types of business ventures and the growth of entrepreneurialism under market socialism. Changing and contrasting management practices are discussed under the two periods of ‘state’ and ‘market’ socialism. The evolution of economic enterprises in China is examined in this historical context because this legacy has shaped many of the present features of management practices in present-day China. Chinese management theory and research is an emergent process, the outcome of which is difficult to predict. Most of the established theories that are applied to the Chinese context have been developed in a western context and, therefore, are not entirely relevant. In this chapter, we highlight the key issues associated with contemporary Chinese management thinking and practice in relation to business growth. Relevant management practices are discussed by reference to different organizational contexts and ownership forms. These are state-owned enterprises, privately-owned enterprises and foreign joint ventures. State-owned enterprises (SOEs) are also undergoing management restructuring, corporatization and ownership diversification. The reform of state-owned enterprises has long been restricted by the Communist Party’s socialist ideology, but, even so, they have undergone various reforms aimed at improving management efficiency and injecting entrepreneurialism into their organizational development under market socialism. We discuss these issues by reference to a case study of a state-owned enterprise. One of the striking features of China’s economic reforms – transforming from a command to a socialist market economy – is the rise of the entrepreneurial sector. The rapid growth of privately owned enterprises has become a driving force for the Chinese economy, as well as a dominant ownership form in the economy. These private enterprises are organized in very informal ways because of how they have emerged from the shadow of the state-owned economy. Their distinctive management practice and strategies are discussed by reference to a detailed case study. Foreign investment, as a salient constitution of the Chinese economy, plays an increasingly substantial role in market transformation. Foreign joint-ventures are major employers in China and, as a result, their employment policies and management practices have a strong bearing on reshaping the pool of human resources and the experience of work for a significant proportion of workers in China. Their capabilities are based upon a combination of local skills and knowledge with foreign-imported technologies and advanced management practices. These issues are discussed by reference to a case study of a foreign joint-venture. This chapter compares and analyses the distinctive characteristics of these three emerging business types under the conditions of emerging market socialism. These case studies – a state-owned enterprise, a privately owned enterprise and a foreign joint venture – offer organizational profiles of how each form of ownership shapes their distinctive organizational and management practices. They also create challenges and tensions in each type of venture that are likely to shape future trends in the nature of Chinese market socialism. Market socialism comprises both opportunities and problems, which generate complexity and diversity in its unique institutional characteristics. The chapter offers insights into the contrasting roles of different types of business venture in shaping the nature of market socialism. It addresses the challenges and emerging issues that the Communist Party must address in further developing a globally focused transitional economy. China’s global transformation from ‘copycat’ to world-class ‘innovator’ is discussed, as well as the implications of this for future institutional change in what is rapidly becoming the world’s largest, fastest growing economy.